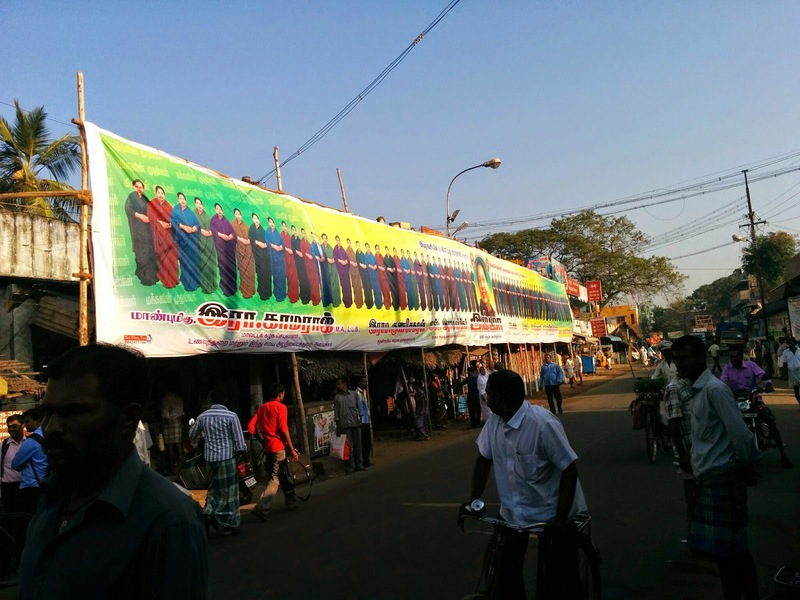 Flex poster printing industry must be a lucrative business in Tamil Nadu as anyone who has anything to say says with flex banners. It does give easy publicity at others' expense. There are flex banners for every possible occasion. From birth to death and everything in between there is a 'case' for flexing flex muscle. These posters mushroom from nowhere overnight and are a public nuisance in most cases. They take the precious road space and hinder vehicular movement. Needless to say they are a big nightmare for pedestrians. Madras high court did pass strictures on flex banners in public places few years back, but nobody seems to care..
Rather long flex banner found in Peralam. I didn't count, but it is a safe bet to say it has 67 images of Ms. Jayalalitha..
Flex industry must have made a killing this week with the birthday of AIADMK supremo Ms. Jayalalithaa. Her party workers made sure everyone knew about Ms. Jayalallithaa's birthday by going overboard with flex banners across the state. I wonder who paid for all these banners and if they got permission to put them up in public places. Well, who dares to ask? It is Amma's birthday after all..